Every sports personality has had humble beginnings. The Nehru Stadium in Faridkot is one such a place. It has been home to many athletes, some even competing at the Olympics. Arshdeep, a sponsored child, trains here in badminton. She is the eldest of 4 siblings. 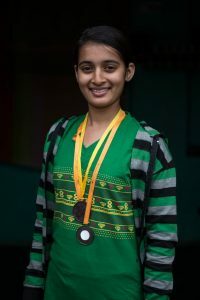 She is in 9th standard and is passionate to play badminton. The facilities available to children here are limited. Besides the Nehru stadium, they don’t have many options to pursue their passion for the game. A makeshift outdoor court provides better space to play, and even though the shuttle is not very stable due to the slight gusts of wind, Arshdeep and her friend aren’t deterred from their game. They run, they skip, they stretch and they run some more. 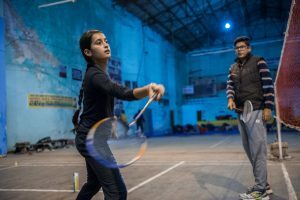 Training isn’t easy for Arshdeep but stamina and agility are very important for badminton and she is determined to never give up no matter how hard it gets. Her favourite player is Saina Nehwal, currently ranked number 2 in the world, and she hopes to get a chance to play with her someday. The players do practice drills repeatedly in order to be familiar with the movement during an actual game. Even though Arshdeep’s village, Golewala, is barely 30 minutes drive from Faridkot town, her mother, Paramjeet, had never visited the town until 5 years ago when World Vision India began work in the region. Not all of Arshdeep’s time is spent in school and training. She is also part of the Youth Girls Club organised by World Vision, where she has many friends. Arshdeep may not be an Olympian yet but she is determined to continue playing badminton no matter where life may take her. “I want to be an engineer when I grow up,” says Arshdeep. “I know it requires a lot of work but I will put my mind to it and give time for both my studies and badminton. It’s a passion I won’t give up on,” she ends confidently. Well done Arshdeep! Great going keep it up. We need more sporting youngsters like you. God bless! Congratulations Ms. Arshdeep. May God bless you. Well done Champ Arshdeep! More success in future. Keep up the good work. God Bless you dear. Arshdeep, you are such an inspiration to so many of us… a true champion in life! God Bless !!! Well done Arshdeep, keep it up! Wish you luck and joy in all you do. Congratulations on your achievement Arshdeep. You are amazing! Wishing you many more years of success in sports! I really love the spirot with which she is persuing her pasion. When you feel unsafe. . .
Pawan ram on From children’s club leaders to responsible adultsWell done. Deshraj on From children’s club leaders to responsible adultsI know you all are the best guys. Ajay Arthur on Saving Rupa from MalnutritionI wish to contribute for the children to end malnutrition . World Vision India on Uncaged and Soaring HighHi Rahimlateef, thanks for writing in. You can log on to https://www.worldvision.in/ChildSponsorship/child-sponsor.aspx and select a child to sponsor.